Died: August 30, 30 B.C.E. Cleopatra VII was the last ruler of Egypt from the house of the Ptolemy, a family that had ruled Egypt for generations. She earned an unfavorable reputation during her age, but as the lover of the Roman emperors Julius Caesar (100–44 B.C.E. ) and, later, Mark Antony (c. 81–30 B.C.E. ), Cleopatra has become a romantic legend in modern times. Third daughter of Ptolemy XII Auletes (c. 61–51 B.C.E. 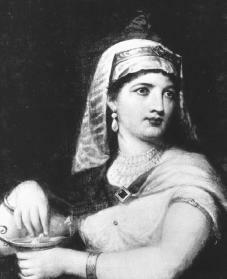 ), Cleopatra was born Cleopatra VII Philopator. Her family could be traced back to the Macedonian house of the Lagid Ptolemies, who took the throne after the death of Alexander the Great (356–323 B.C.E. ). Fifteen consecutive Egyptian rulers from the house of Ptolemy led Egypt, beginning in 306 B.C.E. with Ptolemy I (died 284 B.C.E. ) and ending with Cleopatra's death. The Ptolemaic rule was centered in the beautiful Egyptian city of Alexandria. Historians report that Cleopatra had three sisters and two younger brothers. Both of her brothers ruled Egypt with Cleopatra before their early deaths—Ptolemy XIII (died 44 B.C.E. ) drowned during a fight with Caesar; Cleopatra killed Ptolemy XIV (47–30 B.C.E. ) herself. Much like those that ruled before him, Ptolemy XII's court was plagued with violence and corruption. Cleopatra learned her political lessons from her father. She watched his humiliating efforts to maintain himself on the throne of Egypt by buying the support of powerful Romans. On one such trip to Rome, Ptolemy XII's daughter, Berenice, seized the throne. But her rule did not last, as she was put to death upon her father's return to Alexandria. When Ptolemy XII Auletes died, he willed the throne to his children, Cleopatra and her brother, Ptolemy XIII. The two ruled jointly as Cleopatra VII and Ptolemy XIII Philopator. The ministers of Cleopatra's ten-year-old brother found him much easier to control than his sister, however. As a result, Cleopatra was driven from Egypt in 48 B.C.E. Cleopatra made preparations to return to Egypt by force, but when Caesar arrived in Alexandria after the Battle of Pharsalus, she saw the opportunity to use him. She had herself smuggled to him in a rug. Ptolemy XIII died fighting Caesar, who restored Cleopatra to the throne with another brother, Ptolemy XIV, as coregent, or acting ruler. The relationship between Caesar and Cleopatra grew from their mutual longing for power and money. Caesar wanted the riches found in Cleopatra's court, while she longed for power in Rome. Contrary to legend, Caesar did not stay long in Egypt with Cleopatra. Although in 46 B.C.E. she gave birth to a son whom she named Ptolemy Caesarion, Caesar never formally recognized him. That same year Caesar invited her to Rome. Although he spent little time with her, her presence in Rome may have contributed to the sour feeling towards him which led to his assassination (political murder). After Caesar was killed by a group of men plotting to overthrow his empire, Cleopatra returned to Alexandria in April 44 B.C.E. Shortly thereafter Ptolemy XIV died under mysterious circumstances. It is commonly believed that Cleopatra herself poisoned him. After her brother's death, she made her son, Caesarion, her partner on the throne, and they awaited the outcome of the political struggle in Rome. She responded eagerly when Mark Antony summoned her and other puppet rulers to Tarsus in Cilicia after the Battle of Philippi. Matching her preparations to the man whose weaknesses she knew, she dazzled Antony and bent him to her will. She easily cleared herself of a charge of helping Brutus (85–42 B.C.E. ) and Cassius (died c. 31 B.C.E. ) in the conspiracy to assassinate Caesar. Also, at her request, Antony put to death three people she considered a threat to her throne. In the winter of 41 and 40 B.C.E. Antony followed Cleopatra to Alexandria, where he enjoyed the pleasures of the Ptolemaic court and the company of the queen. Cleopatra hoped to tie him to her emotionally, but Antony left Egypt in the spring of 40 B.C.E. In the autumn of 37 B.C.E. Antony sent his wife, Octavia, the sister of Roman Emperor Octavian (63–14 B.C.E. ) back to Italy on the excuse that she was pregnant. He then went to Antioch to make final preparations for his invasion of Parthia. In Antioch he again sent for Cleopatra and went through a ritualistic marriage—a marriage with a ceremony but that was not recognized under Roman law. Antony was therefore still legally married to Octavia, although he recognized the twins Cleopatra had with him. Additionally, he made extensive grants of territory to her, including Cyprus, Cyrene, and the coast of Lebanon—all lands that were previously part of the Ptolemaic empire. In 36 B.C.E. Cleopatra returned to Alexandria to await the birth of her third child with Antony. The failure of the Parthian campaign and Octavian's exploitation of Antony's misadventure drove Antony further into the arms of Cleopatra. In return, she gave him immense financial help in rebuilding his shattered army. When Antony defeated Artavasdes of Armenia in 34 B.C.E. , he celebrated his triumph not in Rome but in Alexandria. On the following day he declared Cleopatra and Ptolemy Caesarion joint rulers of Egypt and Cyprus and overlords of all lands west and east of the Euphrates, a river in southwest Asia. For Cleopatra, acquiring these lands meant uniting the Ptolemaic empire with the land of the former Seleucid empire—all under her control. (Founded by the King of Babylon, Seleucus I [c.354–281 B.C.E. ], the Seleucids were a family of kings that ruled over Macedonia from 312–64 B.C.E. The Romans had broken up the empire shortly before the time of Cleopatra's rule.) Meanwhile, Antony staked out his claims on Egypt's wealth for the coming struggle with Octavian. In Italy Octavian used the donations at Alexandria and Antony's relations with Cleopatra to turn public opinion against Antony. The Battle of Actium (September 2, 31 B.C.E. ) was a fight for the control of the Roman Empire and led to disaster. Because Cleopatra's money built the fleet and supported it, she insisted on fighting at sea. When she fled from the battle with the war chest, Antony had little choice but to follow. After Actium, Cleopatra tried to negotiate with Octavian for the recognition of her children as her successors in Egypt. But such recognition would cost her—Octavian demanded Antony's death. Cleopatra refused. After the final battle outside Alexandria on August 1, 30 B.C.E. , Octavian's troops defeated Antony. After receiving a false report that Cleopatra was already dead, he stabbed himself. Antony died in Cleopatra's arms inside her mausoleum (tomb), where she had barricaded herself with the treasures of the Ptolemies to keep them from Octavian. Tricked into surrendering herself, Cleopatra tried again to negotiate with Octavian. Cleopatra was refused. She then carefully planned her own death. On August 10, after paying last honors to Antony, she retired to her quarters for a final meal. How Cleopatra died is not known, but on her left arm two tiny pricks were found, presumably from the bite of an asp (a snake). Flamarion, Edith. Cleopatra: The Life and Death of a Pharoah. New York: Harry Abrams, 1997. Green, Robert. Cleopatra. New York: Franklin Watts, 1996. Gregory, Kristiana. Cleopatra VII, Daughter of the Nile. New York: Scholastic, 1999. Walker, Susan, and Peter Higgs, eds. Cleopatra of Egypt: From History to Myth. Princeton, NJ: Princeton University Press, 2001. Not much help to me, but it was a little...well goodbye!!! This article is kind of what i was looking for but this page needs to be more... more.... accurate on the real past not just something sombody made up. Acually this applies to the whole website... make sure your not giving us stuff that didn't really happen. because this article sounds like a bunch of balonge. Very interesting about the way you used the information. More in detail then other sites. This article interested me more than others. The story of Cleopatra told is not acurate but told to interest. Well written and stated on this page.